Commodore Bob Tarrant, the British Commander of Combined Task Force 150, visited Djibouti from 1st to 3rd of October as part of a programme of regional engagement, aimed at improving maritime security in the Combined Maritime Forces area of operations. The visit included meetings with the Commander of the Djibouti Navy, Colonel Cher and Commander of the Djiboutian Coast Guard, Lieutenant Colonel Bogoreh. Commodore Tarrant was very keen to visit Djibouti, on behalf on Combined Maritime Forces (CMF), and saw the visit as very positive. He said: “It is essential that we work together with regional states to ensure that maritime trade continues to flow unhindered through strategic chokepoints’, with Djibouti positioned at the southern end of the Bab al Mandeb, she is an important player in helping us to achieve that aim”. Commodore Tarrant also met with representatives from the EU Naval Force and Commander of the Horn of Africa Joint Task Force, General Baker; General Baker is responsible for the land element of regional security operations. Commodore Tarrant said: “Establishing and strengthening relationships is vital work”. He went on: ‘through the sharing of knowledge and increasing our interoperability we can work together to create a more secure and safer maritime and land environment’. 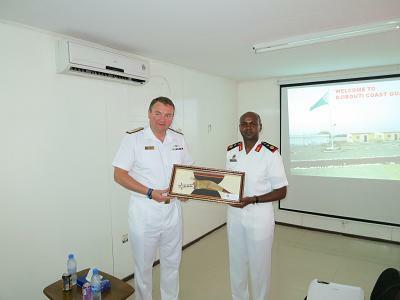 Commodore Tarrant concluded with: ‘The Djiboutian maritime forces are very professional, highly motivated and growing quickly. I look forward to working with them and learning from them during the remainder of my time in Command’.